AIB lands in problem after making a joke against PM Modi! 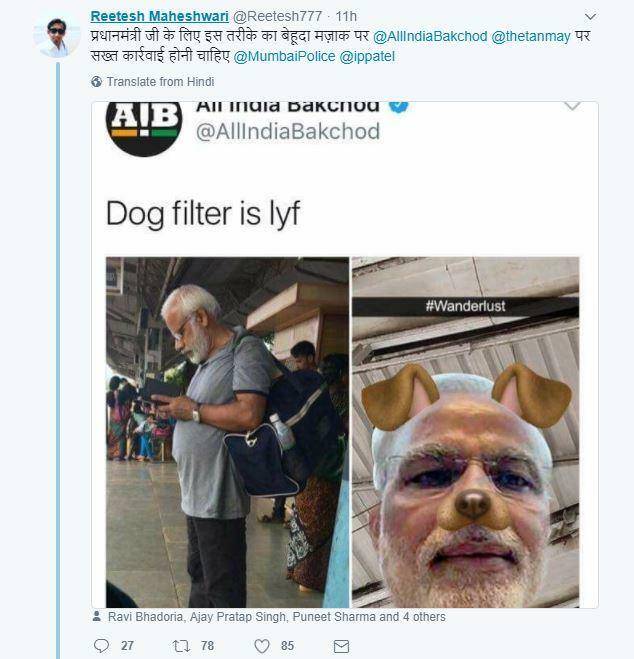 A FIR was lodged against Tanmay Bhatia and his group AIB (All India Bakchod) by the Cyber Cell of Mumbai Police for composing and posting a meme on The Honourable Prime Minister of India Narendra Modi with the Snapchat dog filter. Tanmay later tweeted that, he would continue making jokes and would delete them if it is needed. And would again make jokes and apologize if necessary. He is least bothered about what other people think? PS: Will continue making jokes. And deleting if necessary. And making jokes again. And Apologizing if necessary. Don't care what you think. The Mumbai police have accused the group or making fun of the Prime Minister on Social Networking platform. AIB has been charged with a fine of Rs 5 lakh for defamation and also under the IT act for which the punishment is three years in jail. You actually hold some responsibility. Waking up in the morning and trying to shame some comedians for deleting a meme. Ispe utar gaye ho. AIB had deleted the post after it was targeted by many people as a source of insult for the Prime Minister of the nation. One person tagged the Mumbai Police in his post and requested for appropriate action. The post was an insult not only to the Prime Minister, but also to the national sentiments. Thank you for bringing this to our notice.We are forwarding this to the cyber police station. It is high time that people understand jokes and insult are two other things. It is not just about respecting your profession, it is about respecting your nation, people and its heritage.Till the time we don’t respect our people, nobody else would. Need of the hour is that we learn to distinguish between wrong and right! Next Post:Jacqueline is winning everybody’s heart by her pole dance video!